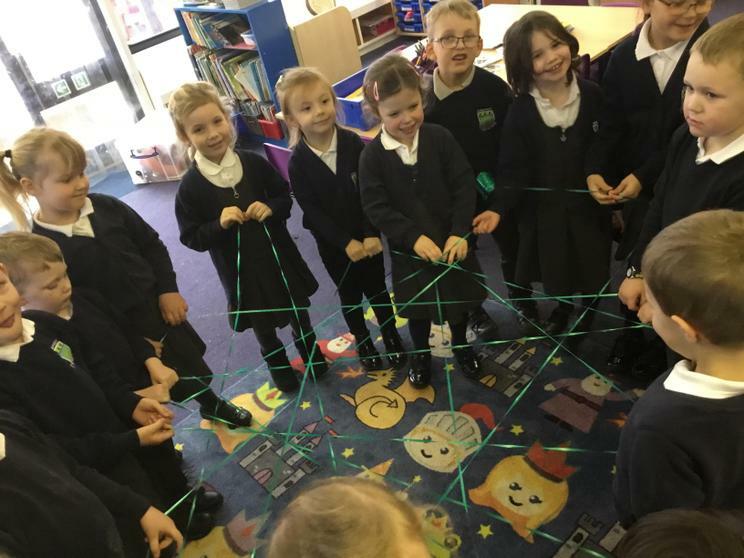 Chestnut Class is made up of some of our Reception and Year One children. 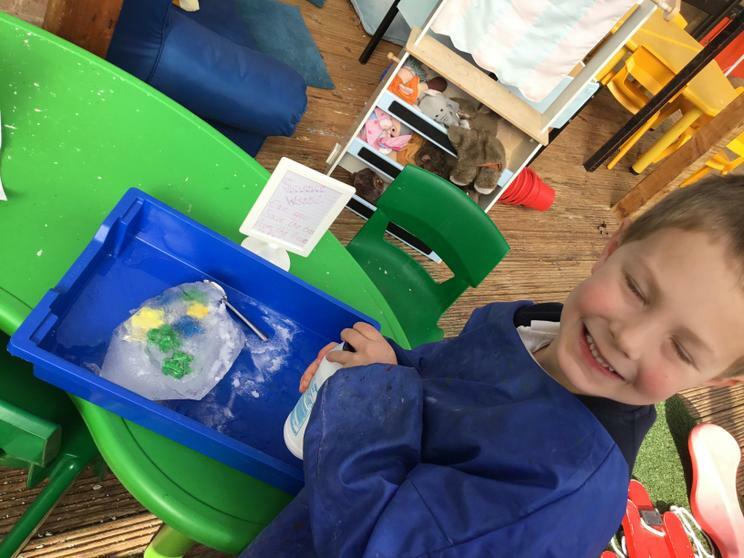 During the children's year with us we hope to provide exciting and fun opportunities to add to their learning journey through school where they develop the confidence to tackle new challenges ready for their future. 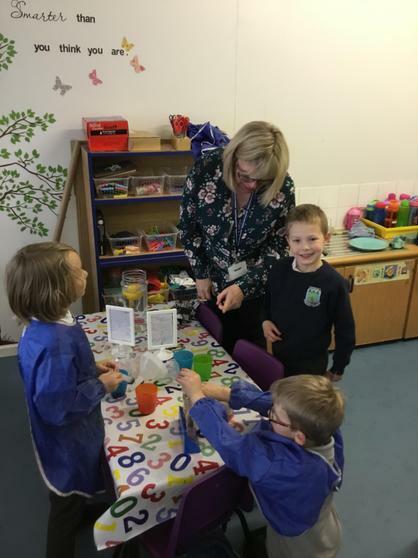 In Chestnut class the adults are Mrs Louisa Webster and Mrs Sue Hart. 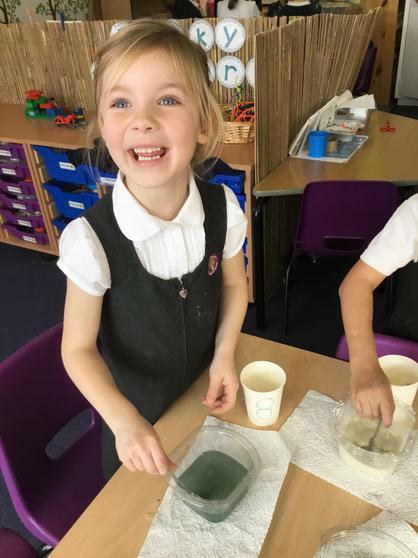 Please come back and check this page regularly to see Class Letters and photos of the work we have been doing in the classroom. This week we have continued our work on the story of Titch. 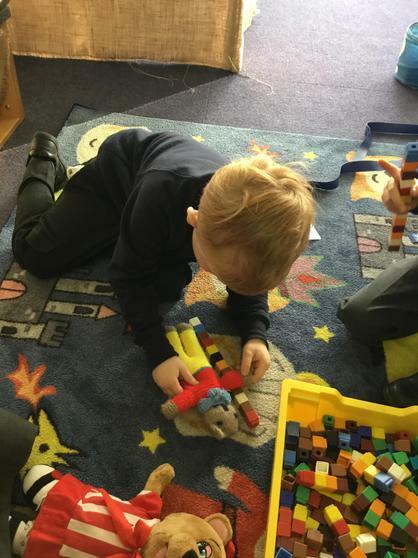 The children have really enjoyed retelling the story and creating their own puppets for the puppet show. 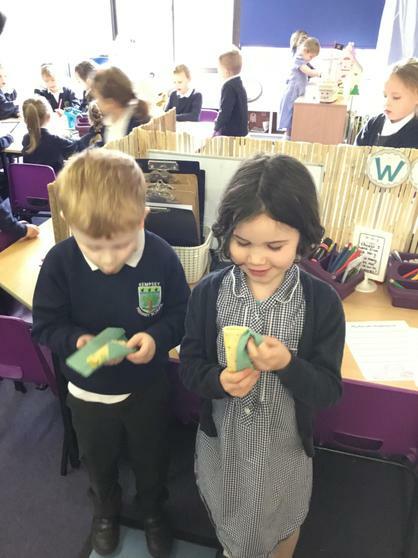 We have also worked on 2D and 3D shapes this week. 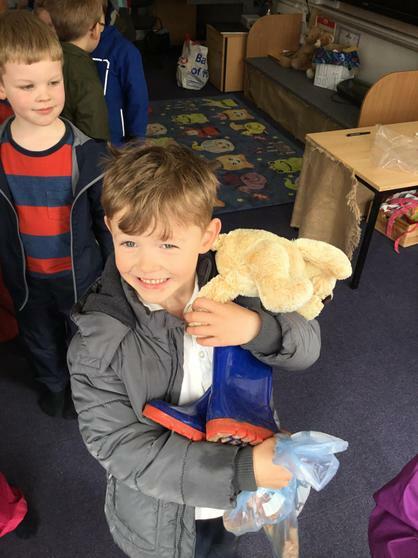 This week we finished off our Bears topic with a day of picnic fun! 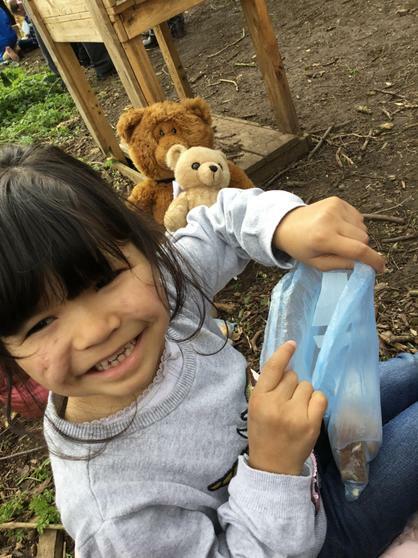 The children invited their parents to join us with their teddy bears in Forest School. 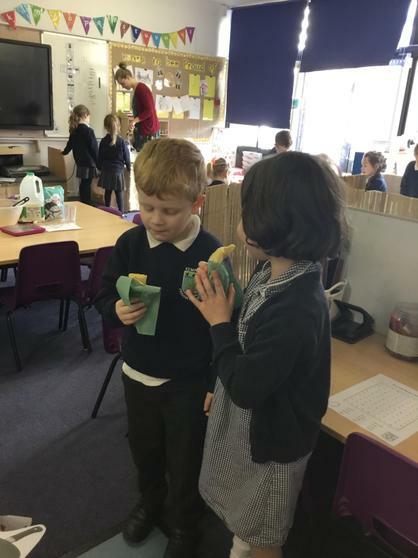 In the morning we made our own sandwiches and delicious chocolate chip cookies. 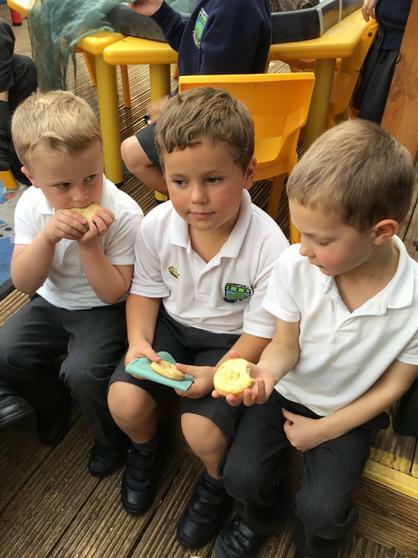 In the afternoon we went down to Forest School and enjoyed having a picnic with everyone. The rest of this week we have begun working on the story of "Titch". 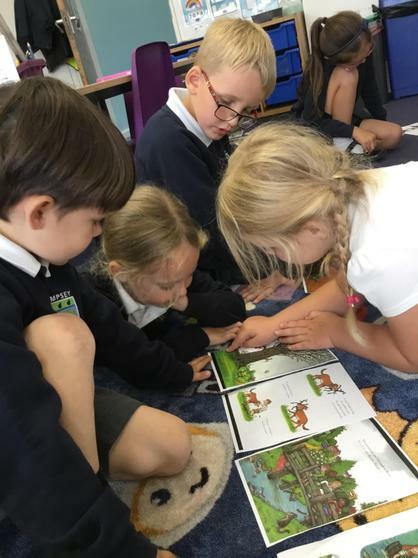 The children have really enjoyed discussing the story so far. 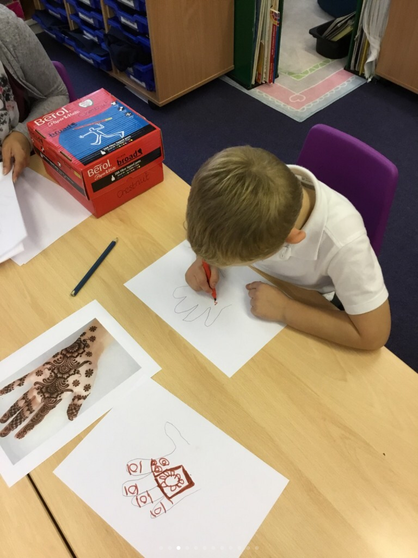 On Thursday, we talked about what the children remembered from when they were little and how they have changed. 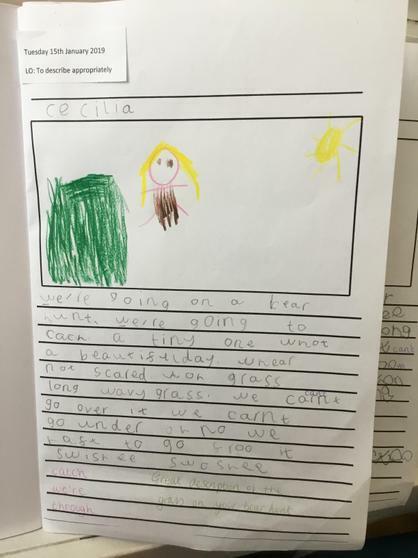 We have been very impressed with the children's writing this week! 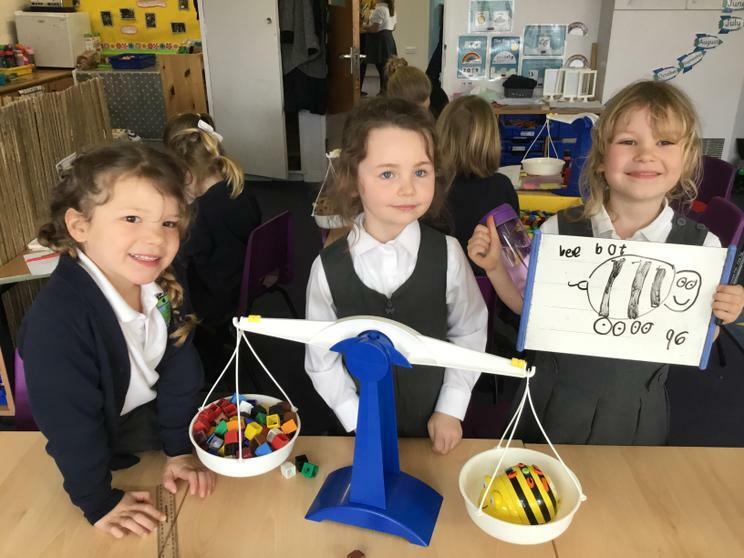 This week was Science Week in schools around the country. 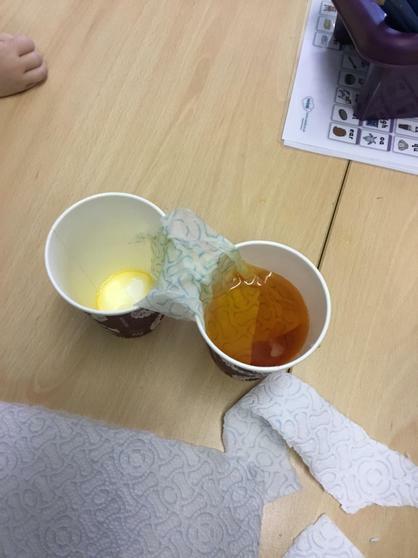 We focused on "Journeys" and did lots of experiments to look at different types of journeys. 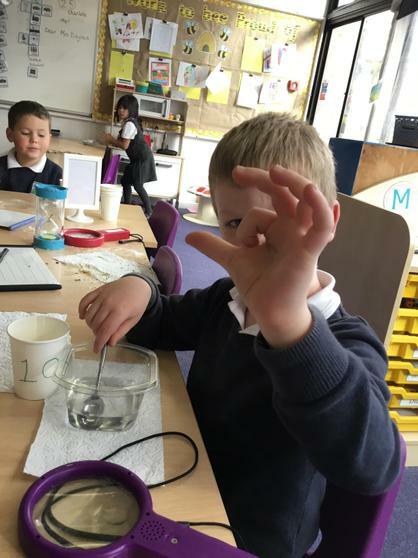 On Tuesday, the children in Reception went to Hanley Swan Primary and took part in a fantastic science day, full of different journeys. 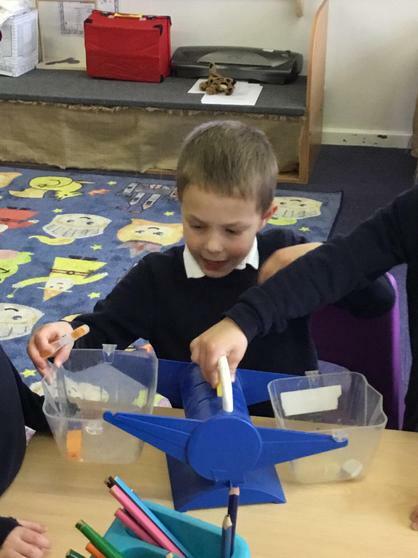 The children made and tested paper aeroplanes, looked at the journey to space and enjoyed playing with magnets. 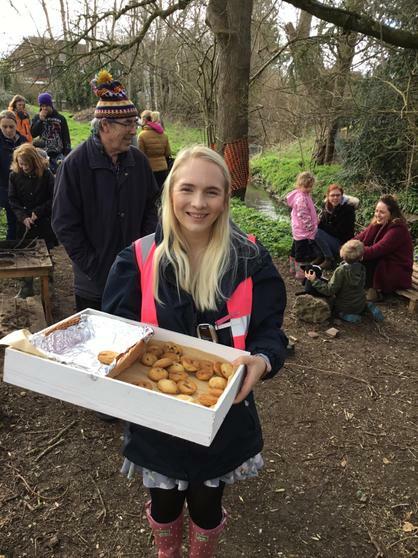 This Friday afternoon was also Enrichment afternoon and the children enjoyed going to their new groups and spent the afternoon doing yoga, sewing, forest school, sign language amongst other things. 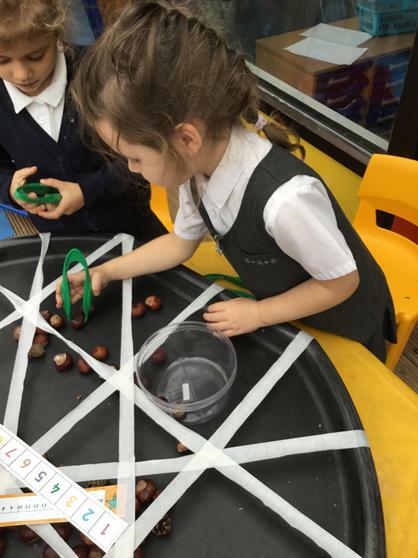 This week in Chestnut class has been full of exciting learning! 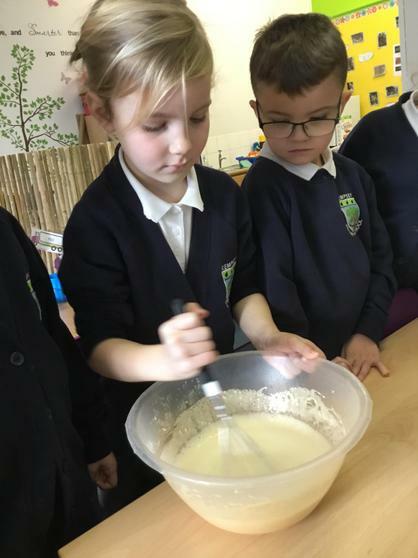 On Tuesday, the children loved being involved in making pancakes and especially tasting them at the end! 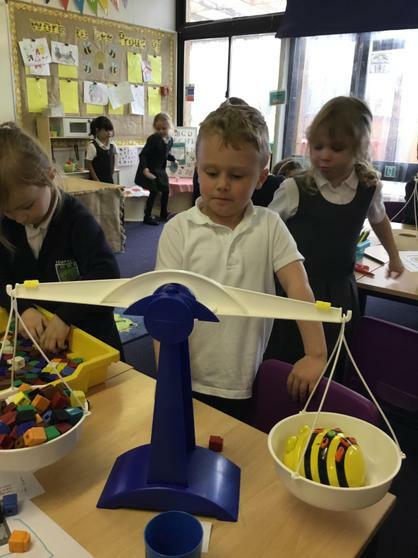 This supported the children’s understanding of weights and measure, which we will continue to explore next week. 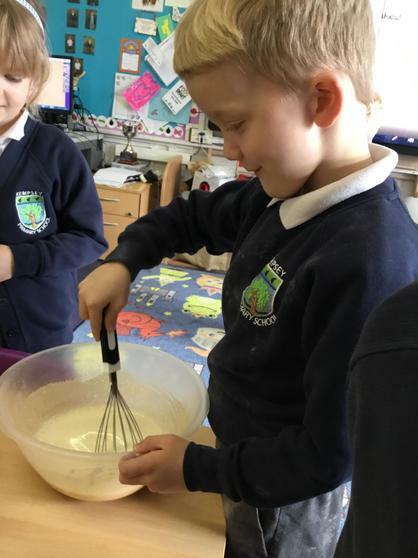 In English, we wrote a set of instructions for how to make pancakes. 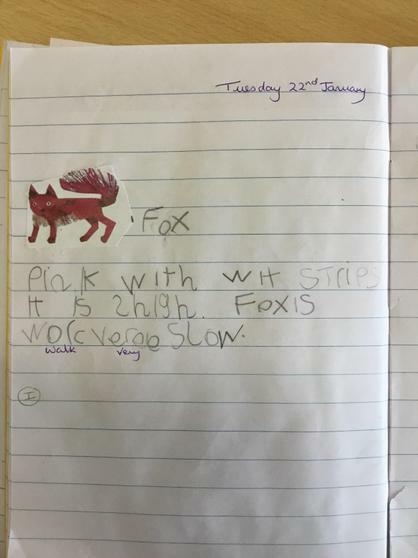 The children really impressed us with this piece of writing. 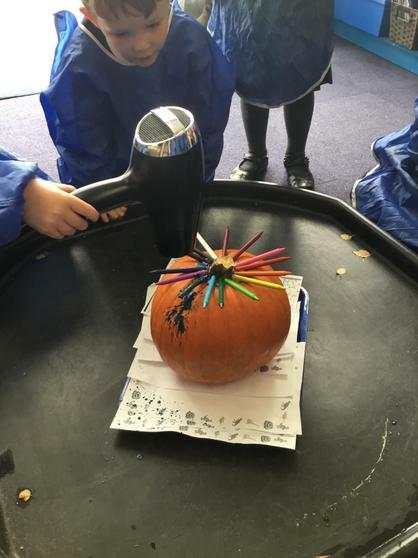 It was so neat and detailed and the children were extremely proud of their work. 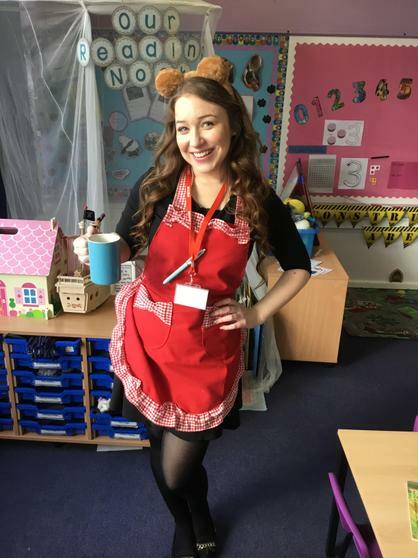 On World Book Day, the children’s costumes were fantastic! 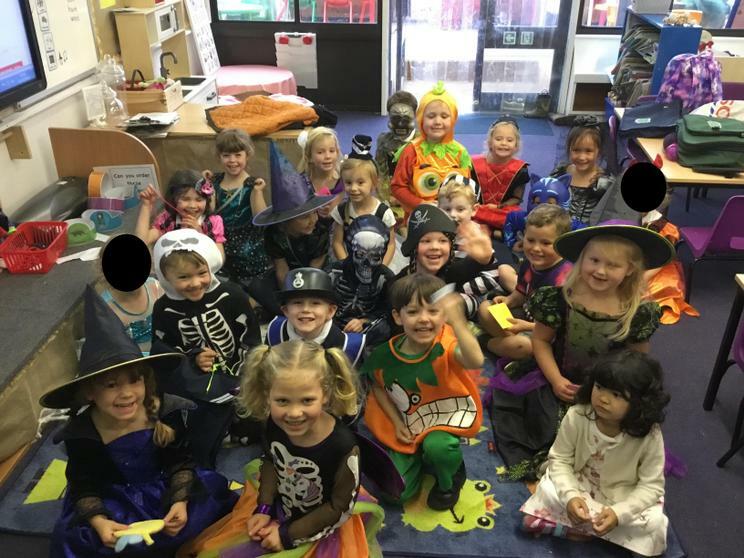 The children enjoyed sharing their costumes and the reason why they chose their particular character. We spent the morning sharing stories together. Today, we had a special visit from our class fairy again! 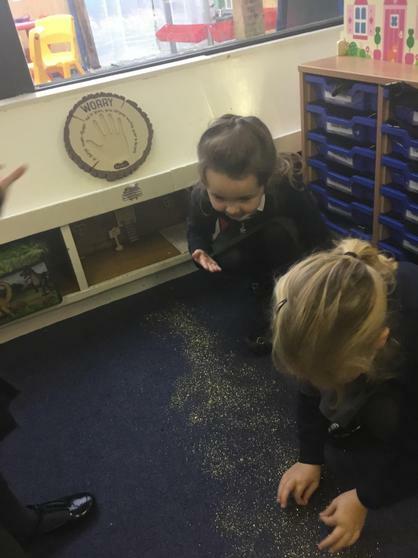 When we came back from assembly, the children returned to find a trail of fairy dust all around the classroom and a letter from our fairy, Sparkle. 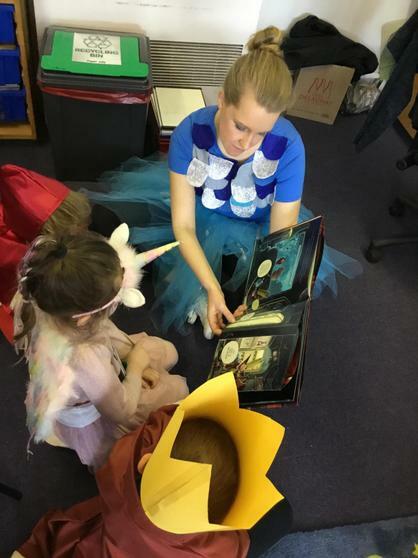 The fairy was upset to have missed our costumes on World Book Day and so the children decided to write back to her and describe their costumes. 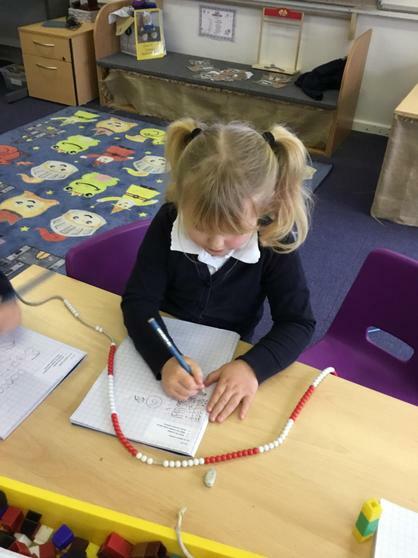 We had some fantastic writing today! Welcome back after the half term break! 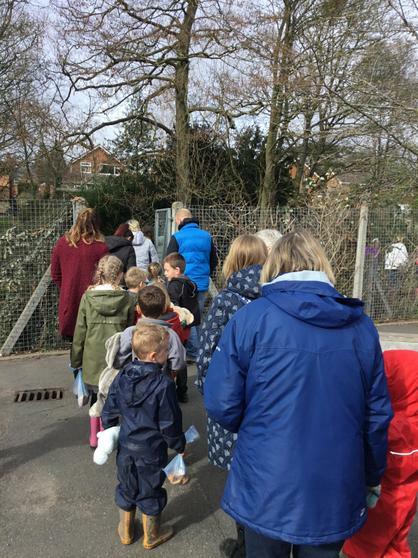 This week the children have come back to school with a great attitude and a spring in their step! We have enjoyed some sunshine this week. 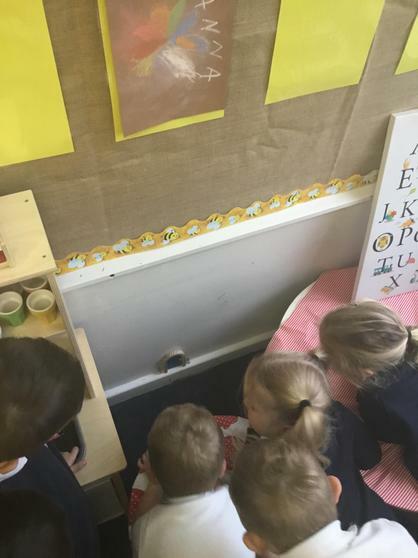 This week we have continued with the book "This is the Bear and the Picnic Lunch". 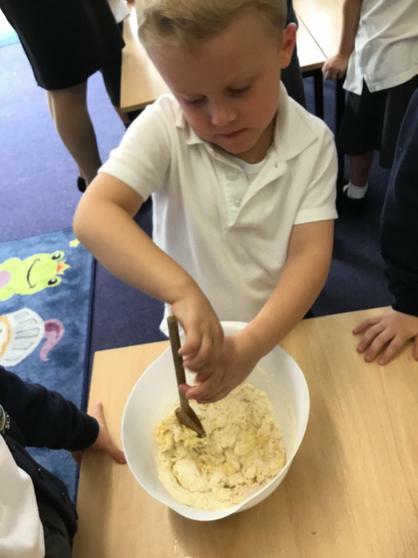 The children have learned about healthy eating. 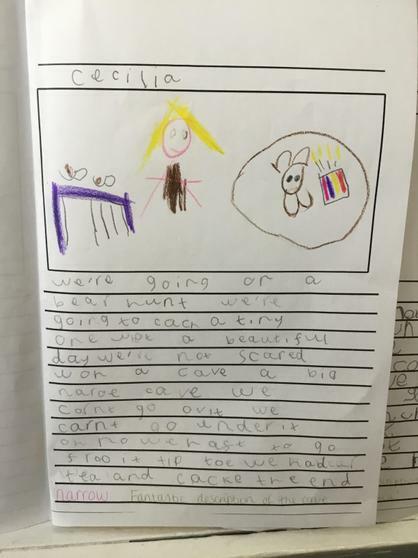 On Friday this week the children will be writing their own invitations to invite you all to our Teddy Bear Picnic. Watch this space for more information! 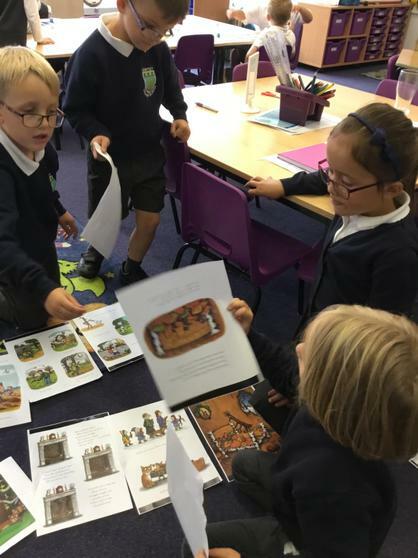 This week the children have been enjoying working on retelling the story of "The Bear and the Picnic Lunch". 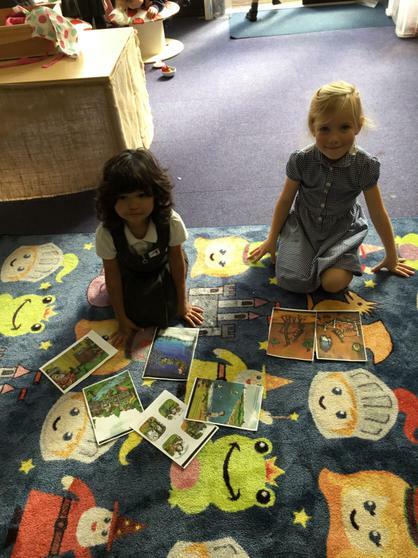 The children have had learned about verbs and have looked at the verbs in the story. 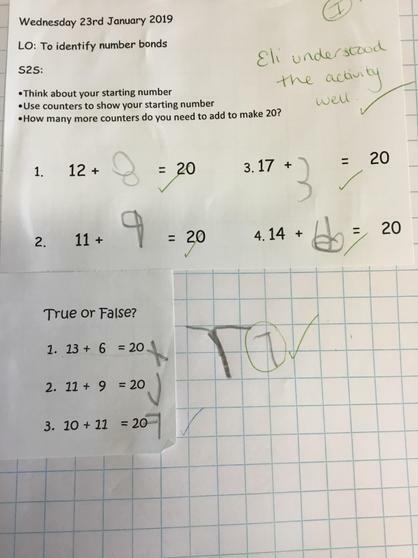 We have done lots of Maths assessments this week and the children have been fantastic! 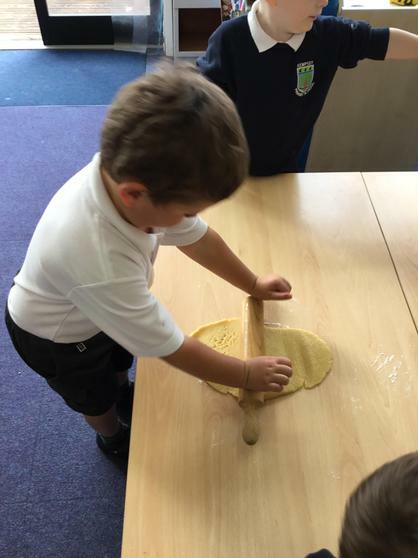 We have been very impressed with all of their attitudes to learning and how well they have done! Also 5his week, we have celebrated Valentine’s Day by doing lots of activities full of love ❤️ The children made lovely cards using their hand and footprints, as well as drawing lots of beautiful hearts! A well-deserved half-term holiday awaits next week! 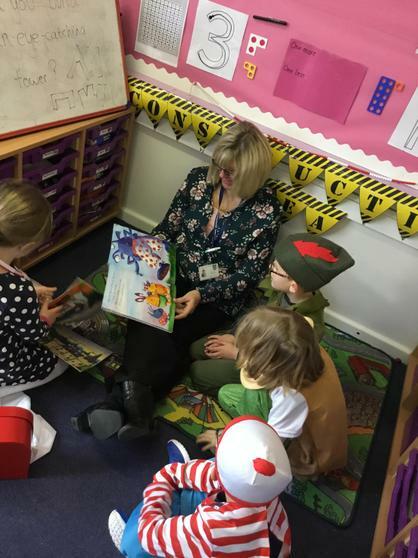 This week the children have read "A Friend for Little Bear". This is all about a lonely little bear who lives on a desert island and needs a friend. The children have loved making their own shelter in the construction area out of cardboard boxes. They used a net to camouflage it and used torches inside to see. 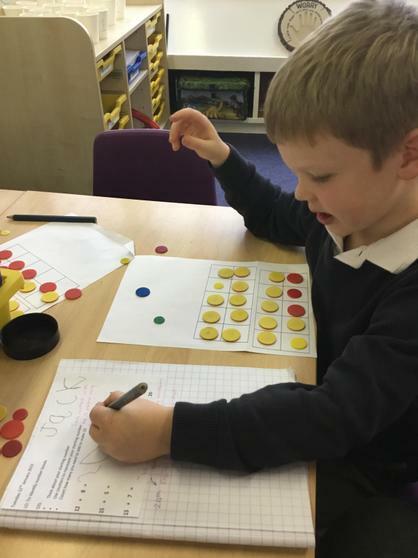 We have also worked hard to partition numbers and work on our understanding of conservation of numbers. This week has also been Internet Safety Week. We talked about what the internet is and how it works. 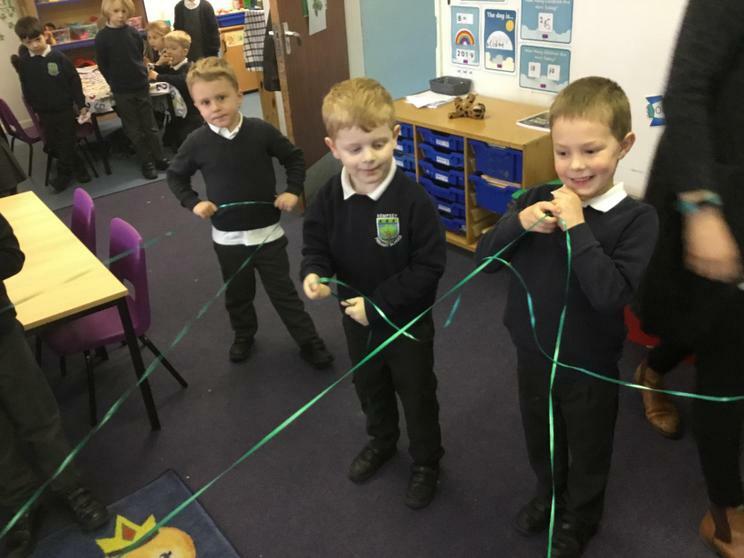 We made a web out of some ribbon to symbolise how the internet sends information. 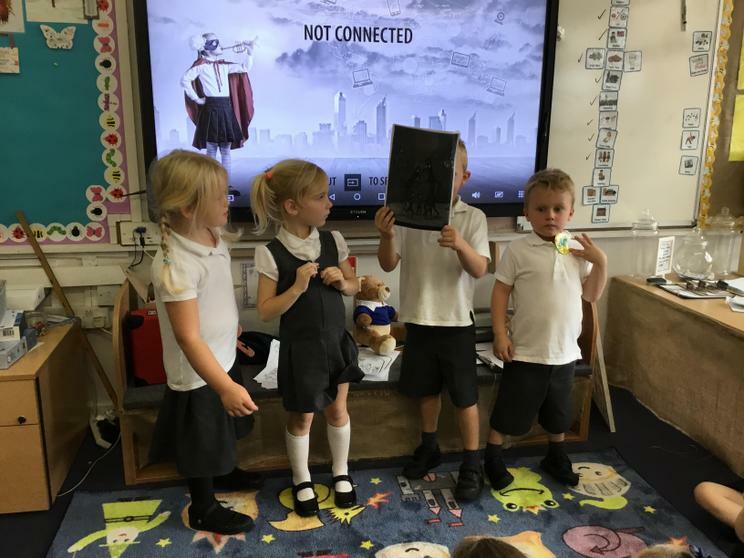 The children talked about their digital footprint and what apps and websites they had visited this week. 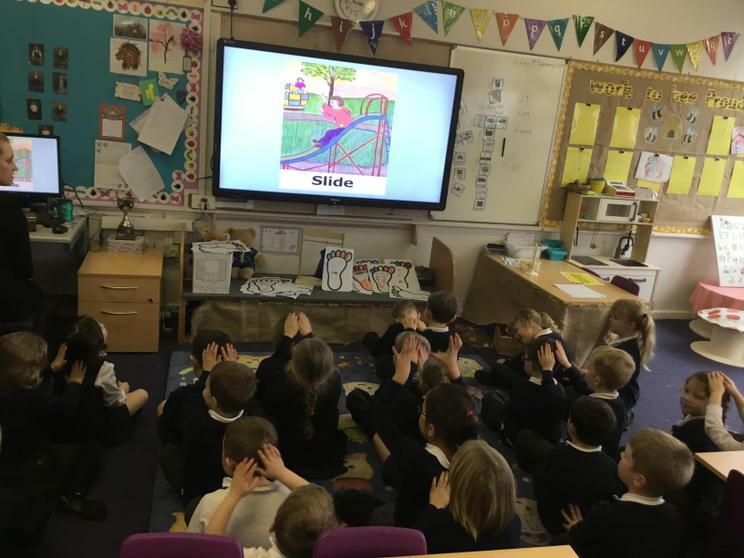 In a special assembly on Friday afternoon, we had a live chat with Hanley Swan Primary School and we talked to them about what we had been learning about this week! It was fantastic! This week has seen the first snowfall of the year! 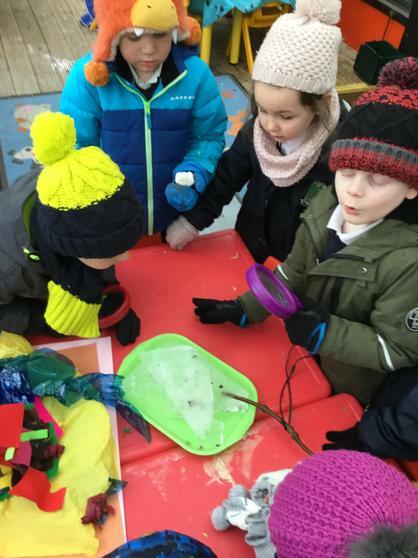 The children loved going outside in the frosty air to spot how their breath froze! 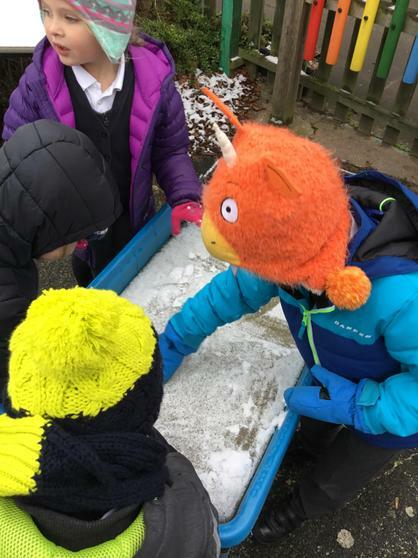 They also talked about how snow is formed and what happens when it gets warmer. 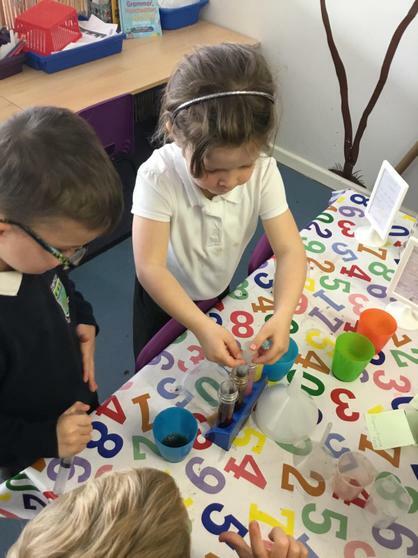 The children finished off their work about the book “Brown Bear, Brown Bear, What Do You See?” and we did lots of practise with our number bonds to 10 and even up to 20. 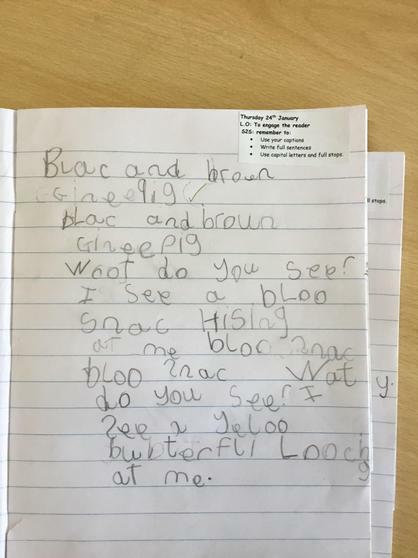 This week, we have looked at another Bear book called “Brown Bear, Brown Bear what do you see?”. 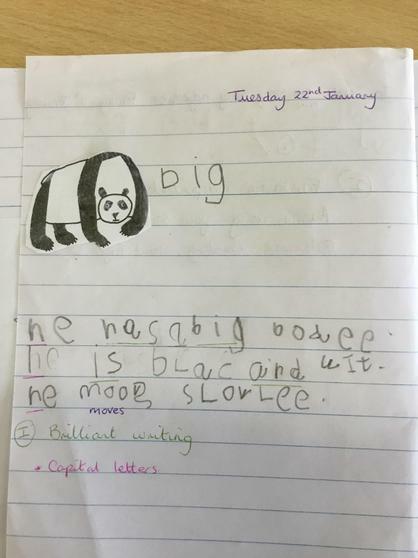 The children have thought about different verbs and adjectives to describe the animals that their bear could see. 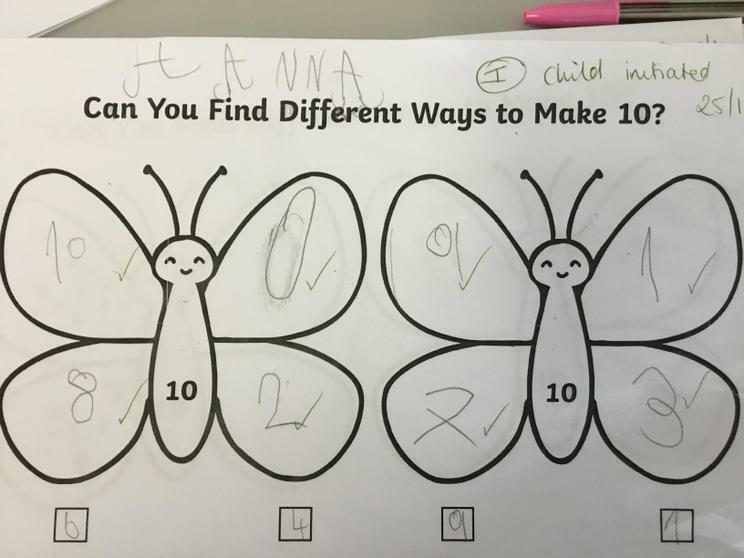 We also worked really hard with our number bonds to 10 and to 20. 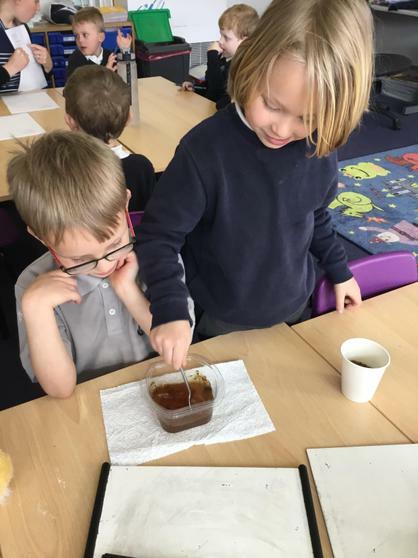 This week, we have continued our theme of Bears with Michael Rosen's book “We’re Going on a Bear Hunt”. 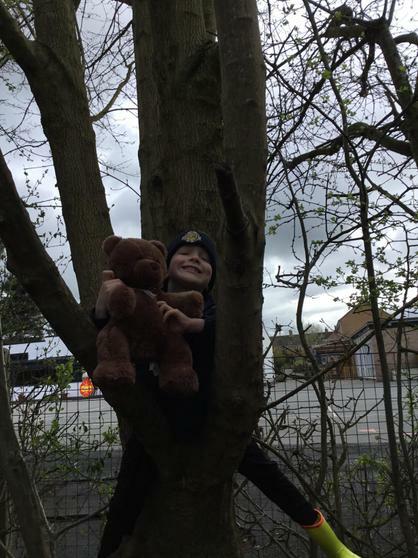 On Monday the children enjoyed a trip to Forest School where they acted out the story and went on their very own bear hunt! 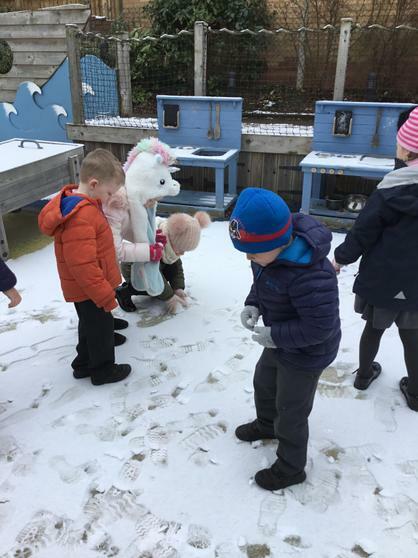 Apparently there are plenty of bears in Forest School! 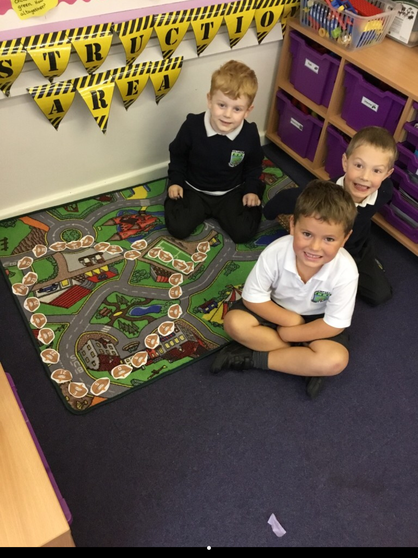 We have also made our very own copy of the bear hunt story, creating our own obstacles to go under and over, as well as rewriting the ending. The children made their own front covers and were really proud of their work. 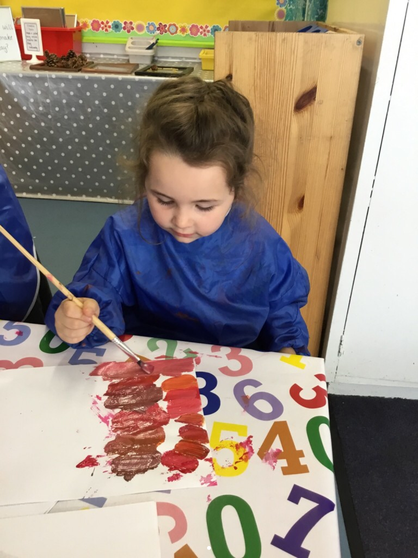 What a start to our Spring term! 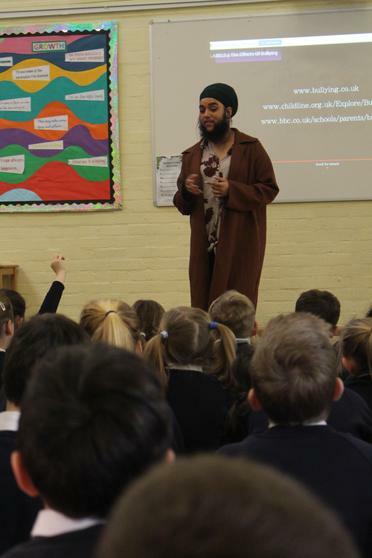 The children had a visit from Harnaam Kaur, a bearded lady, this week. Harnaam is a model, anti-bullying activist and motivational speaker. At the age of 12 she was diagnosed with a condition which causes the growth of excessive facial and body hair. Her experiences with bullying and discrimination growing up make her a very moving speaker on the subjects of body positivity and acceptance. 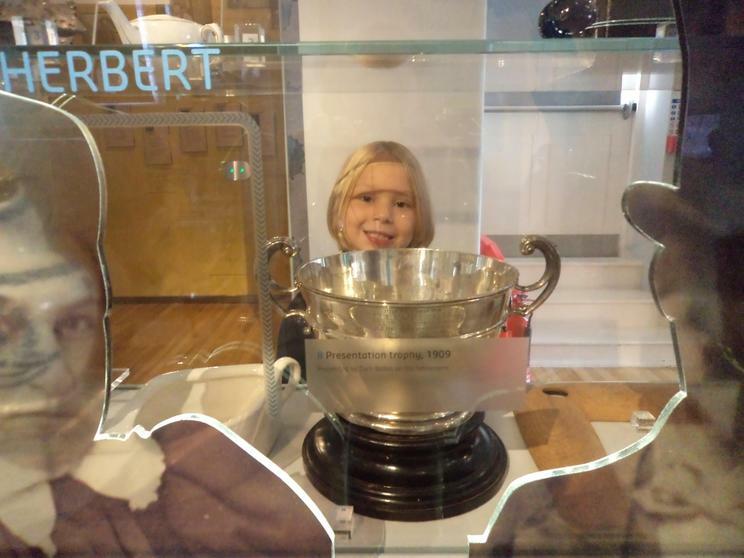 The pupils found her very inspirational. 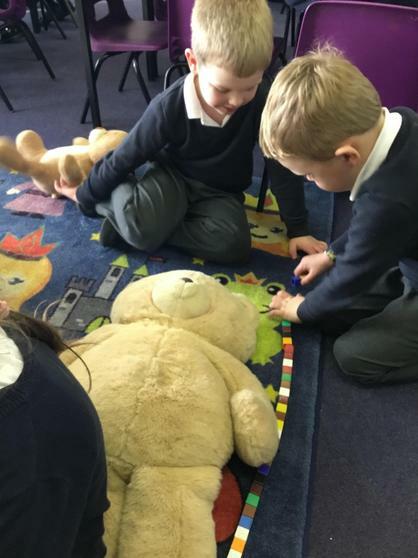 In Chestnut this week we have begun our new topic, ‘Bears’. 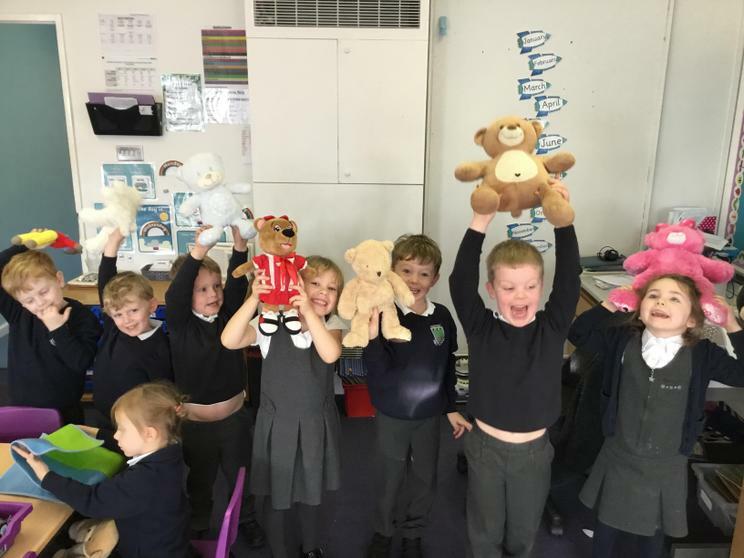 The children have loved having their teddy bears in school with them. 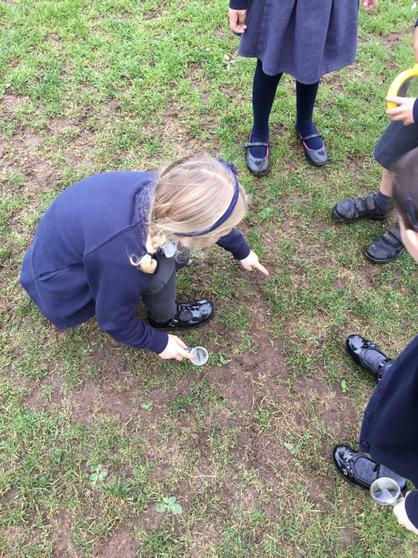 They have used them in their work, measured them, described them and talked to them about their learning. 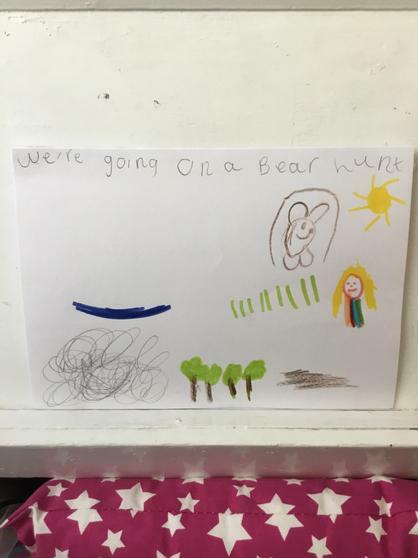 We will be learning all sorts of things about different bears this term; next week we will be starting off with Michael Rosen’s well-loved book “We’re Going on a Bear Hunt”. 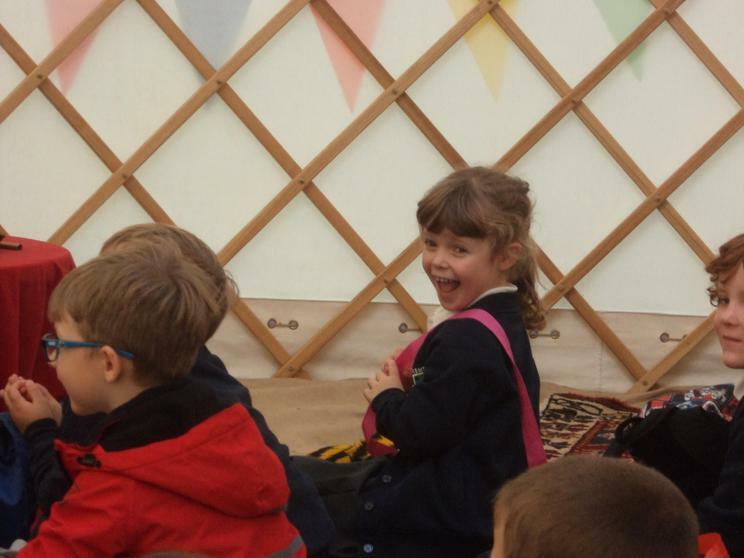 This week has been full of exciting things! 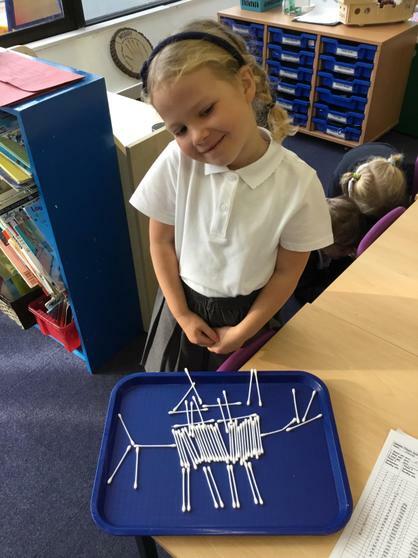 On Monday, it was Bonfire Night; we learned about Guy Fawkes and the reason we have bonfires and fireworks. 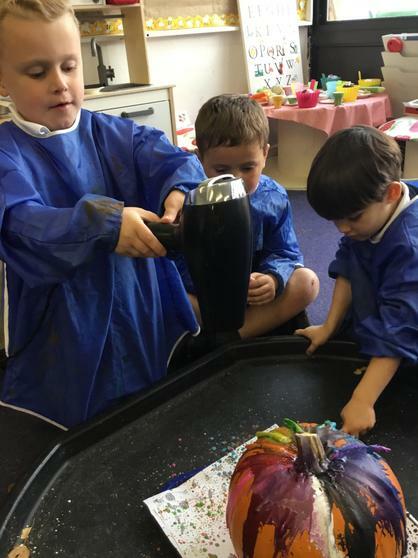 We did some firework painting, described the way fireworks move in the sky and built models of the houses of parliament out of junk and wooden bricks. On Wednesday, it was Diwali, the festival of light. 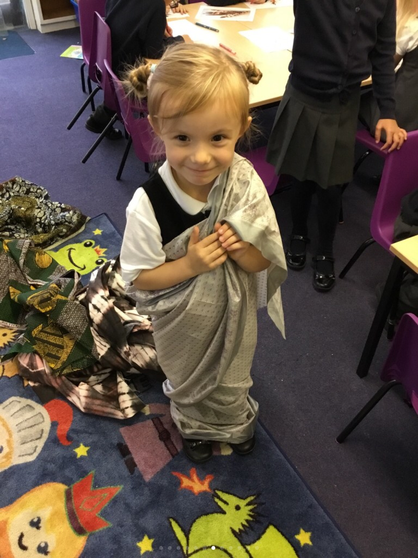 We listened to the story of Rama and Sita which taught us why Hindus and Sikhs celebrate Diwali. The children made Diva lamps out of clay, dressed in saris, created their own Rangoli and Mehndi patterns. 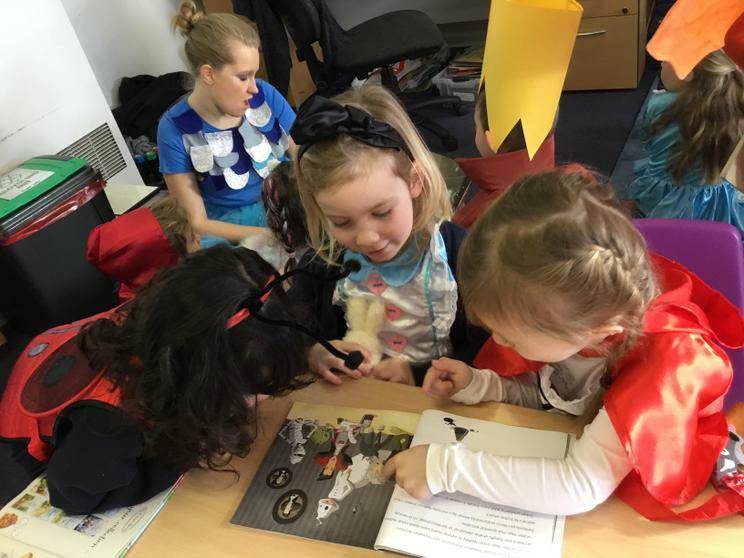 Also this week, we read the story called "Dinosaurs and all that Rubbish". This story is all about how we should care for our environment. On Friday morning we had a surprise from our class Fairy, Sparkle. 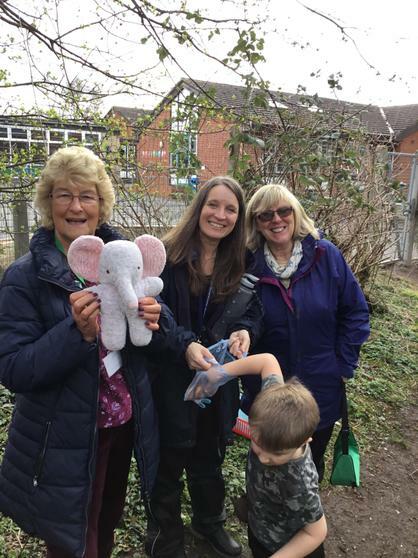 She left us a letter which said that she had been on a litter pick around school with the Dinosaur! 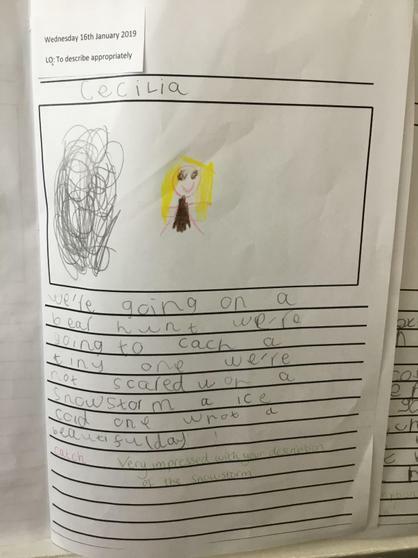 She left us an adventure door too in the hope that we might write her some adventure stories that she could go on herself. 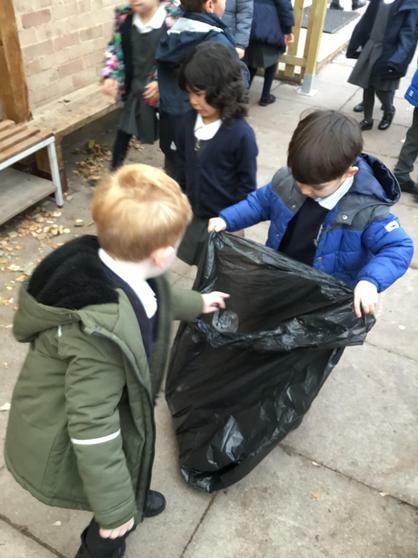 We also went around the school on another litter pick, to help the fairy and dinosaur clean up the school grounds. 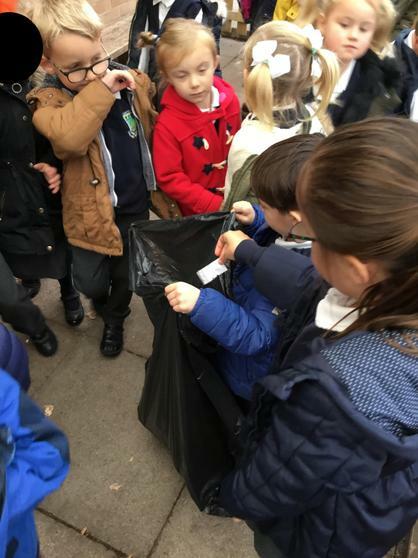 There was lots of litter - we sorted it out into different categories. This week, we have been reading Harry and his Bucketful of Dinosaurs. 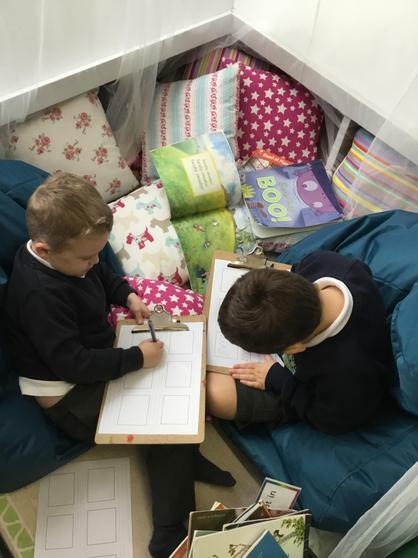 We wrote our own versions of the story and imagined what we might find up in the attic. We found magic castles, a secret door, a ghost amongst other things! 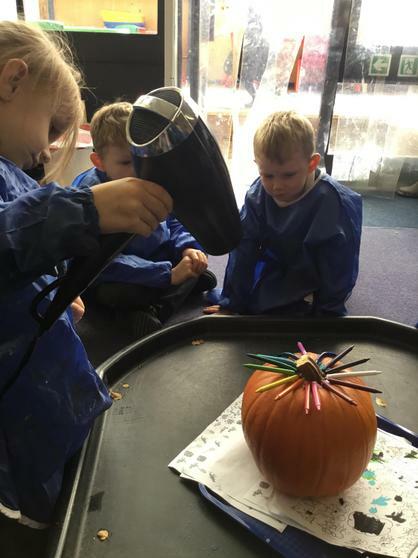 On Thursday, we dressed up for the Halloween disco - for some of us it was our first school disco - we had a great time! 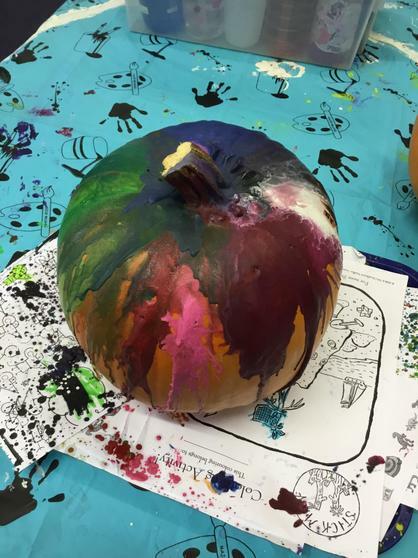 On Friday, we got into the Halloween spirit again and decorated pumpkins. 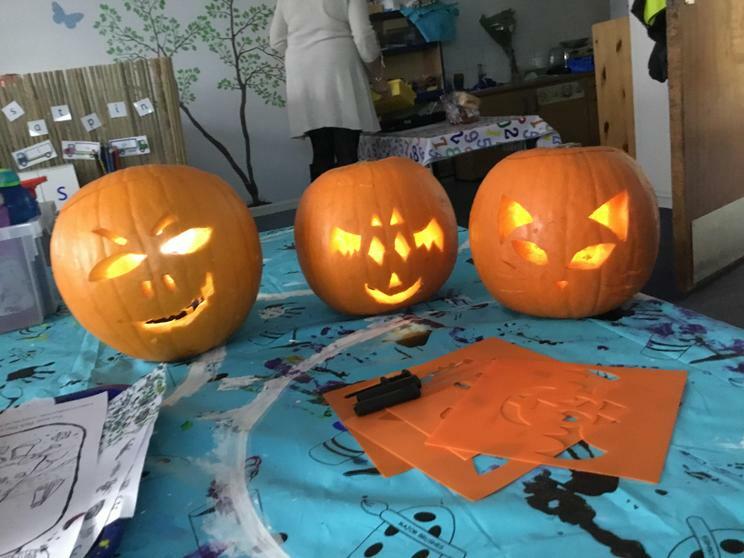 We used tools to scoop out and carve them. 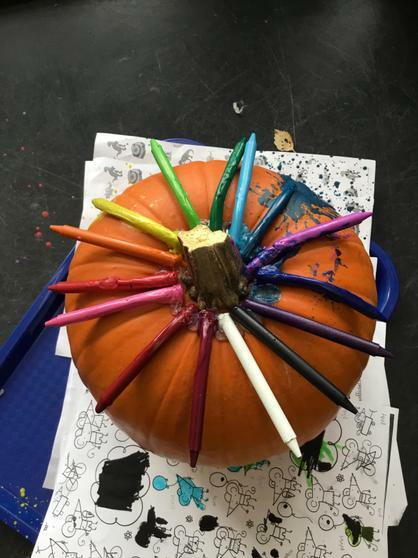 We also glued wax crayons to the pumpkin and melted the wax using a hairdryer. 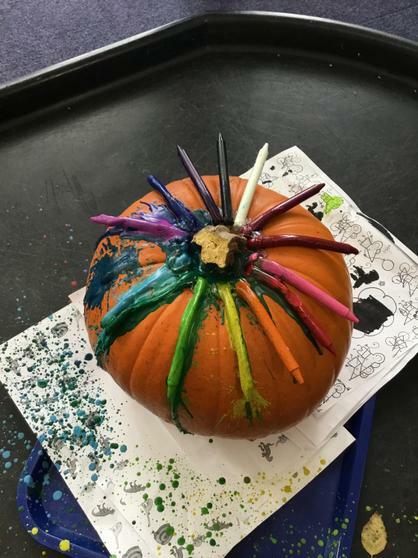 It made a beautiful rainbow of colours all down the pumpkin. 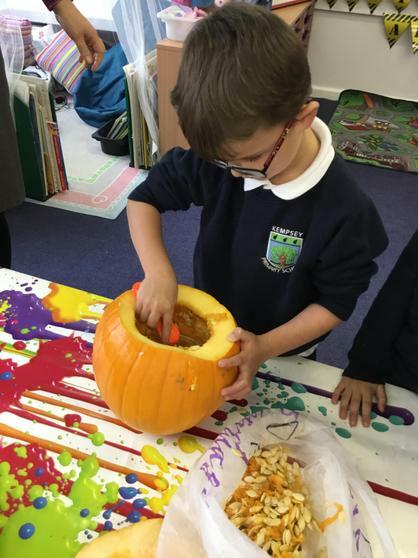 Mrs Webster thought it was so beautiful that she has taken it home to put on her kitchen table! 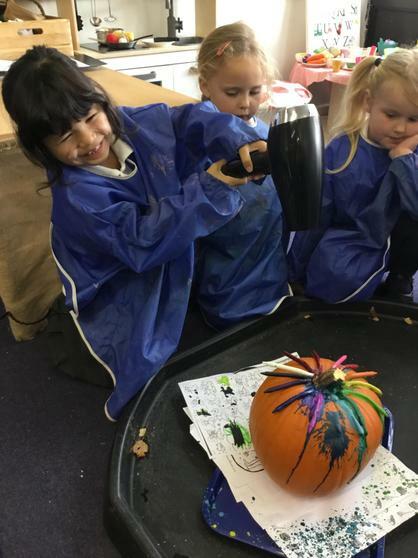 Happy Halloween and Happy Half Term everyone! 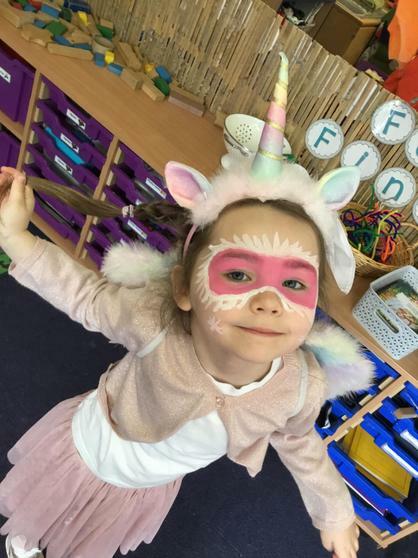 What a great first half term we have had! 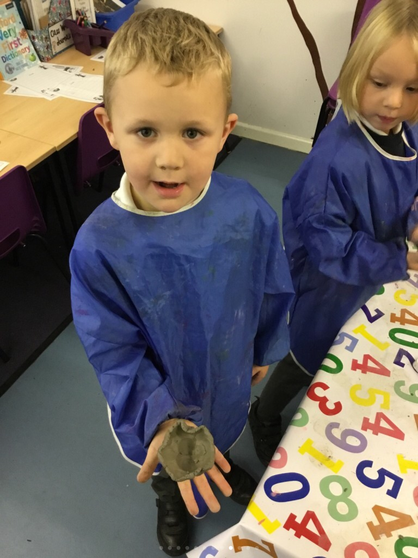 This week, the fairy in Ash class brought us all a REAL T-Rex dinosaur! 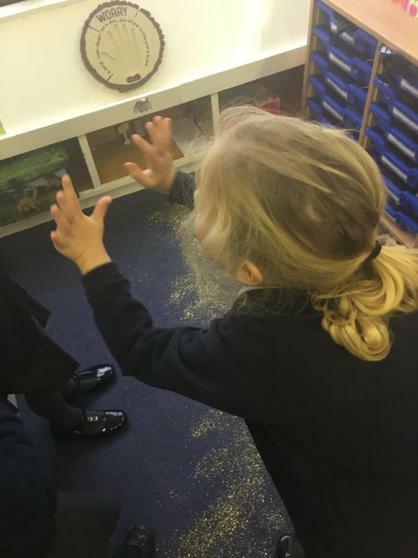 The children in Ash class came to tell us that the box that he was delivered in had been ripped open and all of the classroom had been left in a mess. The dinosaur must have been on the loose somewhere! 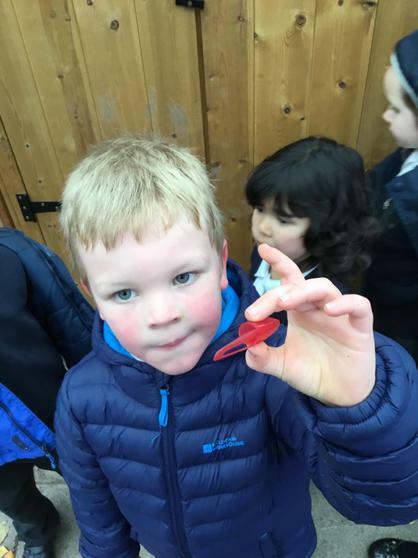 We decided to go on a dinosaur hunt to see if we could find any clues as to his whereabouts. 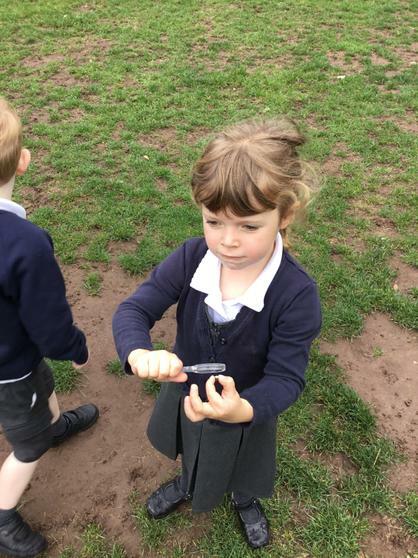 The children found lots of evidence on the field. We checked our CCTV and we spotted him! 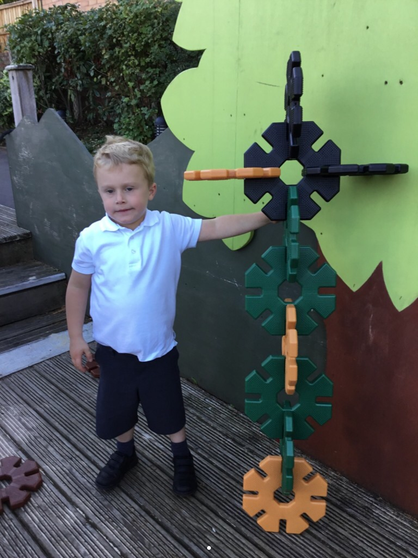 He seems a very friendly dinosaur - he liked to play hopscotch and had a run around in the playground before setting off through our school gates. 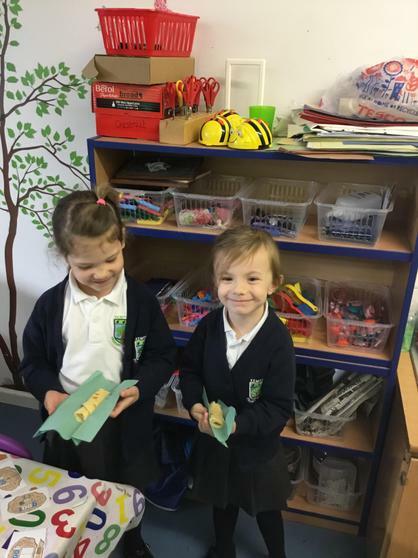 We also wrote him a letter and made him some biscuits to eat in case he was hungry. 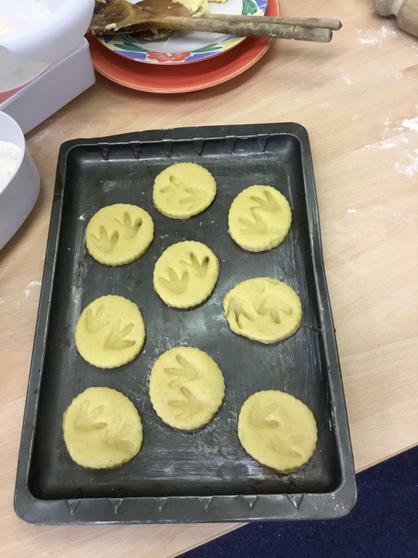 When we came in on Thursday, the biscuits had all gone and all that was left were a few crumbs! Have you seen our dinosaur? 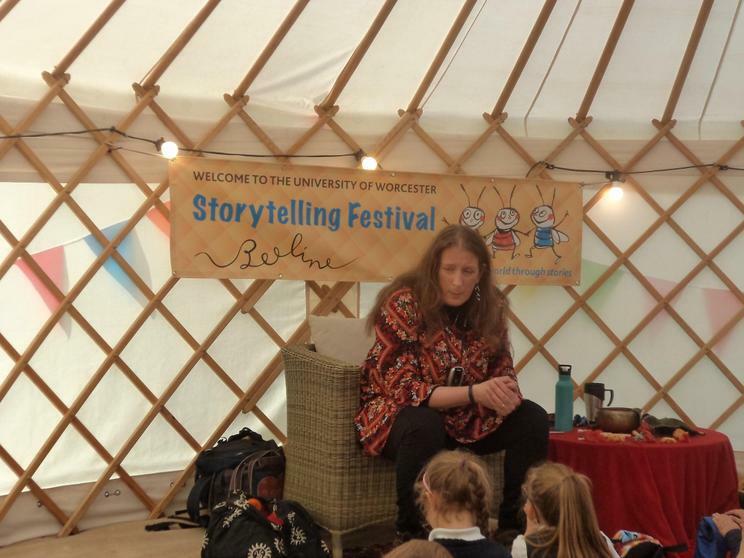 On Wednesday, Key Stage 1 went to UoW to participate in Storytelling Week. 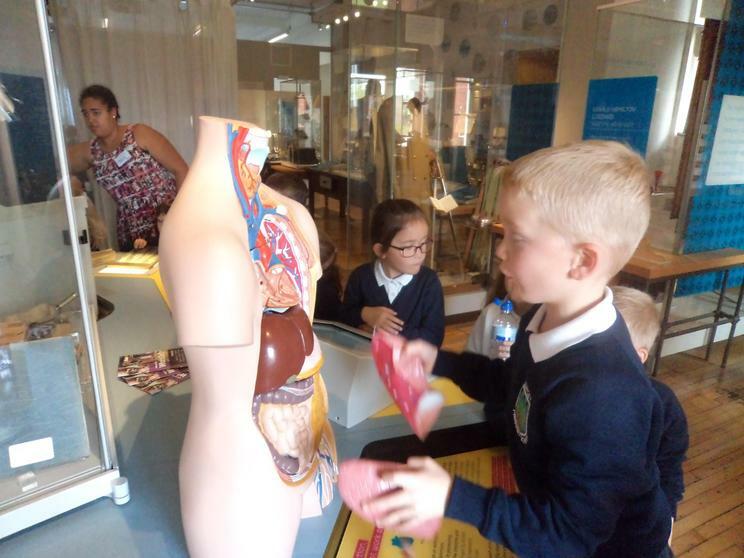 They heard a story about a magic porridge pot, we visited the Infirmary Museum and learned about the history of the University building. 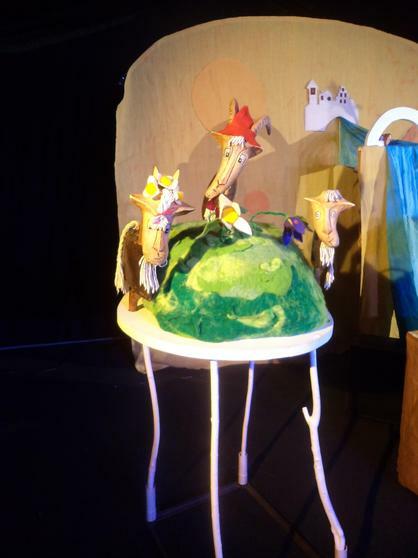 We also finished the day with a wonderful performance from Garlic Theatre of the Billy Goats Gruff. 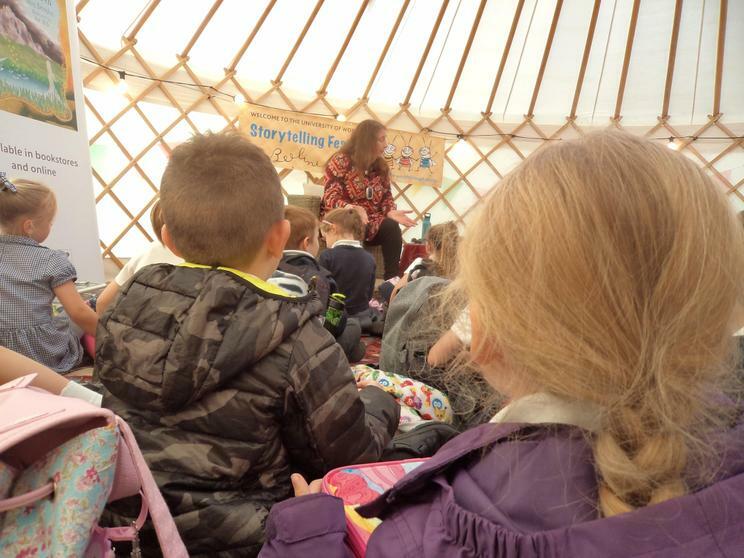 The children had a fantastic time and were retelling the stories all the way home! 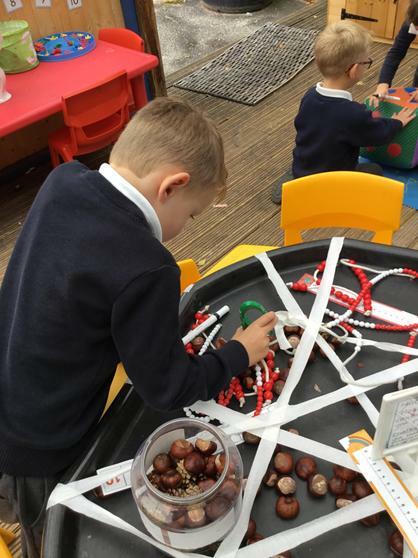 This week we have continued our work to do with Julia Donaldson's book "Stick Man". 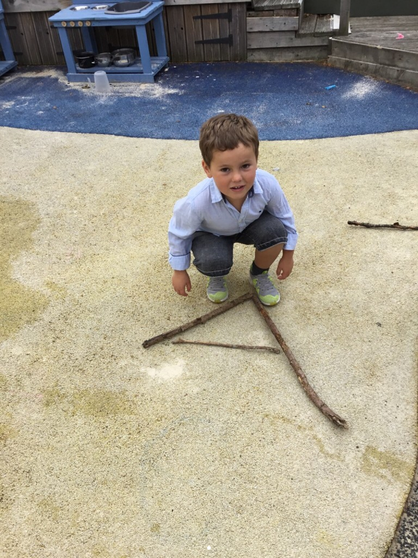 We have been measuring sticks, using sticks to make letters of the alphabet as well as writing some letters to Stick Man himself. 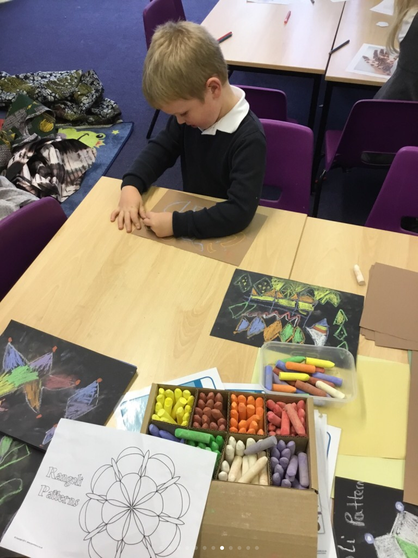 The children have thought about how Stick Man might have felt after finally arriving back home after a long and tiring journey around the country while he was lost. 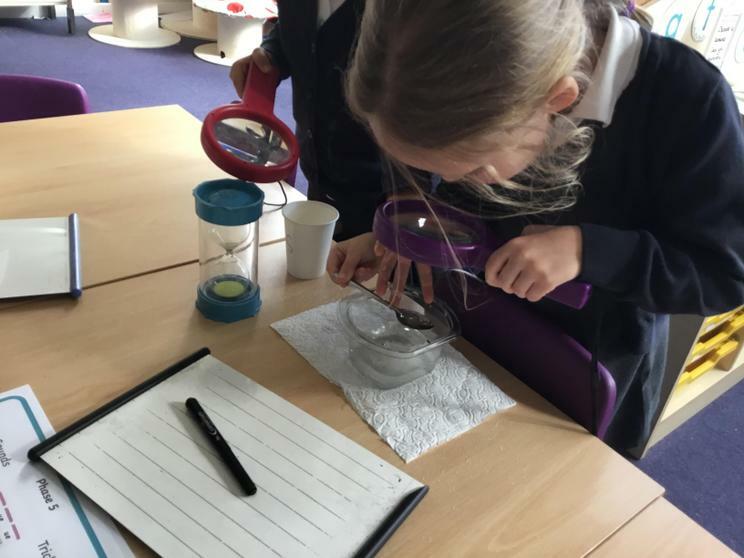 Chestnut Class have started a new topic this week called "Detectives"! 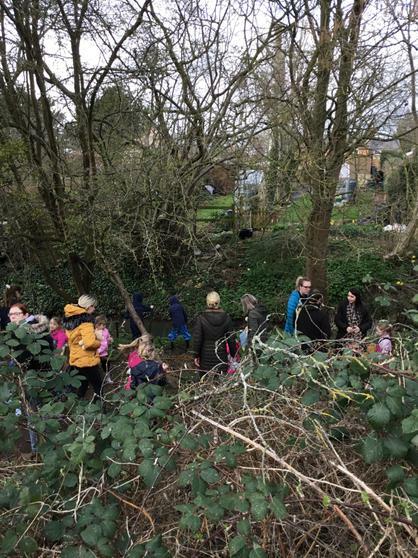 We began our topic by spending the day in Forest School with the rest of KS1. 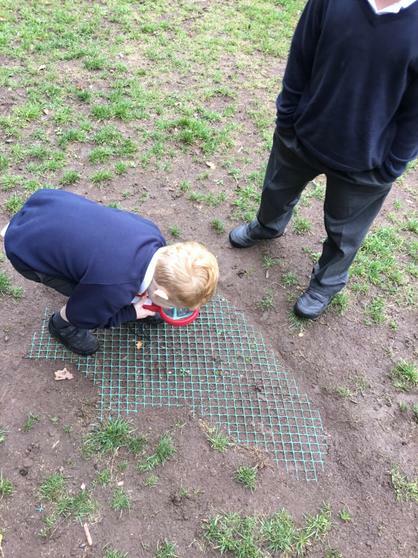 We were Nature Detectives and we loved making pictures inspired by Andy Goldsworthy and finding different leaves on the floor, admiring their beautiful autumn colours.